Required Reading is DoomRocket’s love chest, opened twice monthly to champion a book that we adore. This week Arpad recommends ‘Crowded Vol. 1: Soft Apocalypse’, available March 20 from Image Comics. by Arpad Okay. Charlie is your typical hipster. Big Bob Dylan Desire witch hat. Belly shirt, big frame shades, dog in a bag. Coffee and regret by day, booze whirlwind club terror by night. And, oh yeah, all the apps. 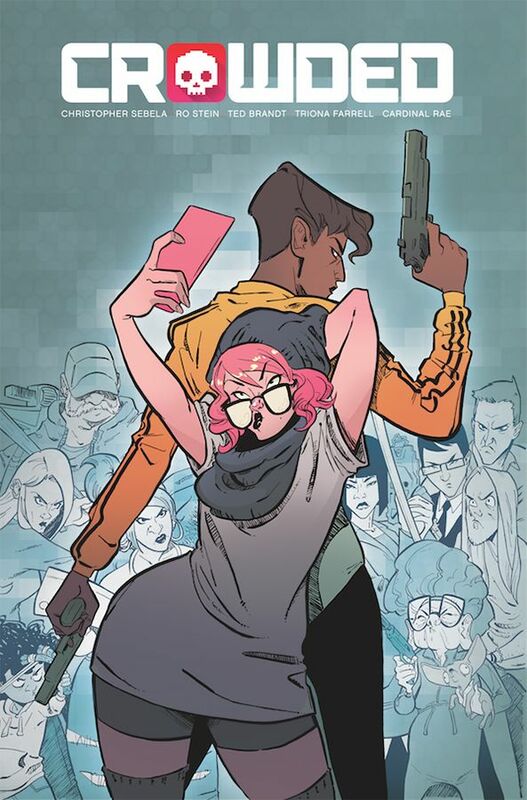 Crowded hits you hard with our commodified future. Charlie is a freelance fifty job app surfer, each day a grocery list of other people’s chores turned into pidgin verbs. Muver. Kloset. Citysitter. Palrent. Moneyfriender. A dozen jobs a day, two dozen micro money moves, and your reward is bed and the same tomorrow. Losing yourself in shallow comfort isn’t all that villainous. Is it? Charlie has a secret. One that landed her on a crowd-funded 30-day murder campaign. Reapr keeps everybody locked into being polite. Slip up, piss the wrong people off, and it’s not WorldStar for you, it’s the slab. Luckily, there’s a bodyguard app for that. 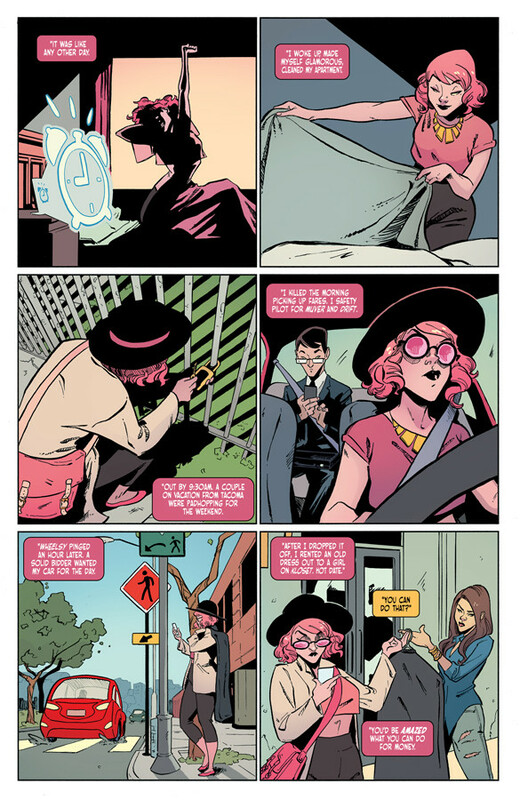 Crowded is a fascinating take on liars, upsetting the unreliable narrator story with the medium of comics: hear the lies and see the truth. Vita, the top-drawer bodyguard who lives in squalor. Trotter, the hype beast live stream killer, wrought with insecurity. The story Charlie tells versus the life she lives. However, Crowded fails to clarify by showing. It sows doubt. Readers get the what and the lie but no why. That said, Christopher Sebela has written a comic about having to be what you truly are, whether you want to or not. Life as the trap that kills you. Bury folks under a landslide of capitalized mundane obligation and homicide for dollars soon follows. The flip side: saving lives becomes immoral. It, too, is business. We just do what we do, draw a paycheck, and die. I find it fascinating how little we know about Charlie’s life. The girl everyone can’t but kill, who is she? Who cares? 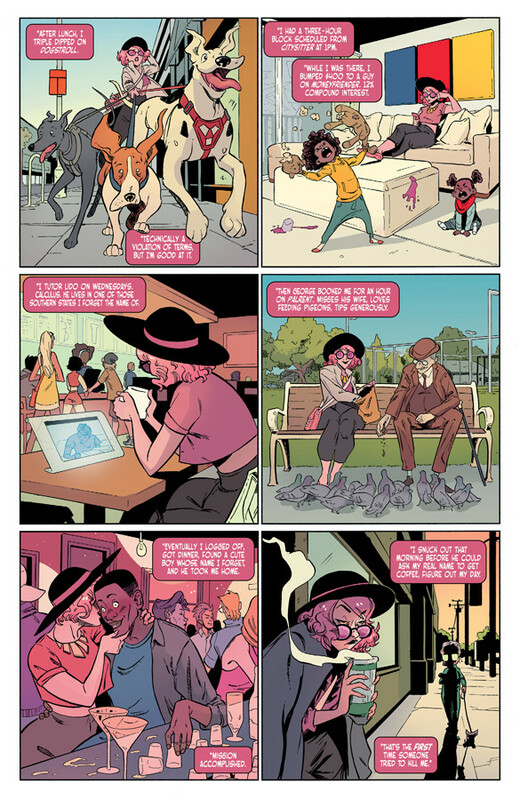 Crowded is all about Vita’s life. 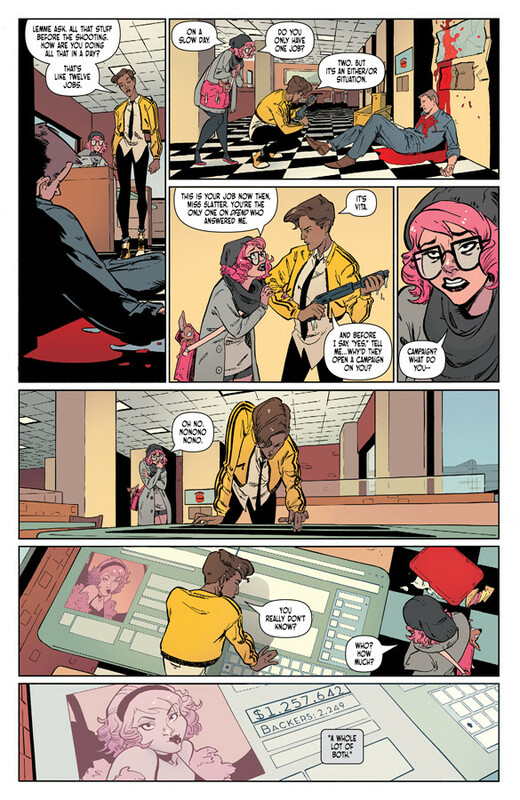 Crowded gives everyone but Charlie a story, history, connections. I can’t remember the last time I read a comic where the lead character has so little substance. Good time Charlie just wants to have fun. Vita is a nail house, a monument of stubborn adherence to self in spite of the changing times. Maybe it’s a mystery. Charlie is just like anyone, everyone. Why kill her? In this book of open secrets, where even the characters without names give you access to their diary entries, there is a wall between reader and protagonist. What did Charlie do that’s so bad she has a record-high price on her head? What is it that’s so wrong, not even Crowded will tell us? Ro Stein and Ted Brandt stand apart as artists, but both have a neat, polished, accurate style of drawing that work well bound together in a series. They draw a story of clean contours and steady lines. Big bendy limbs, shouty mouths, impossible grins, and furrowed brows. The depictions are sketchy and loose at their core, evocative and flowing, but cleaned up tight. They are professional, they are indie, they are Saturday morning cartoons. The action—shooting, chasing, burning, stabbing, mayhem, chaos—it should be scary, but instead Stein and Brandt make it a thrill. They’re great at body language, big gestures and exaggerated facial expressions that speak volumes. That flexibility to the artwork extends in all directions, sometimes characters standing out alone on blank canvas for an important moment, sometimes filling the car with flying groceries as it flips upside down. Tríona Farrell paints the book with an interesting palette, richly saturated, bright color choices, laid over with shadows. Not noir shadows, but a darkness that faintly glows with artificial light. Call it LA by night. Farrell’s grasp of light and color lays flat despite being shifty. It keeps the layers implied by Stein and Brandt’s even linework clear and easy to navigate. 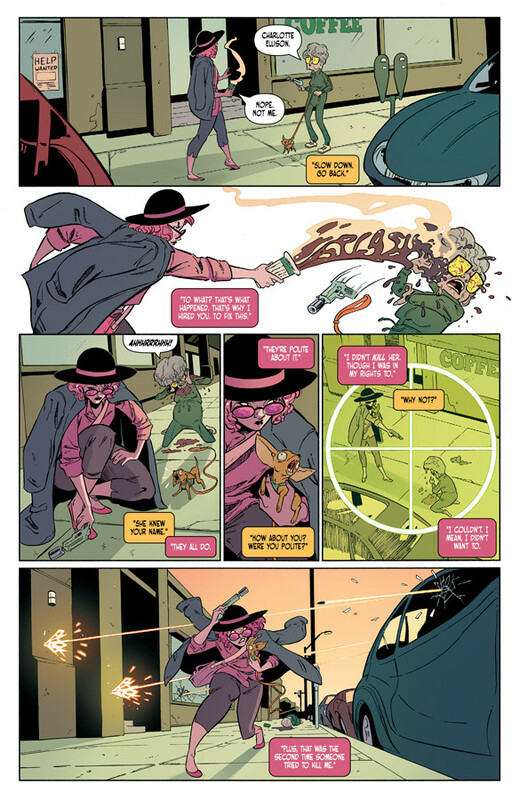 Crowded is a silly book for all its violence and murder and poisonous feelings. It tells those hard truths of what’s to come with a wry smile. And at its heart: heart. You wish the near kisses would connect. You pity the wretched. You want everyone to get out alive. Illustrated by Ro Stein and Ted Brandt. 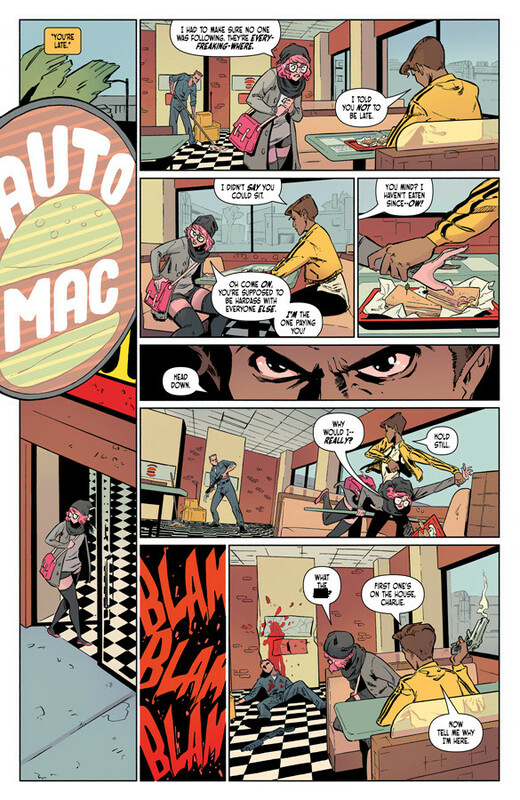 Check out this 5-page preview of ‘Crowded Vol. 1: Soft Apocalypse’, out March 20 from Image Comics!